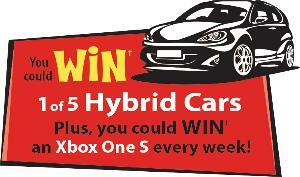 Prize: (5) Grand Prizes a Hybrid Car, which will be a Toyota Prius C ($29,000 CAD) or equivalent cash value. 12 weekly prizes - Xbox One S with Forza Horizon 4 and 3 months of Xbox Game Pass. Statistics: This contest was opened by 156 and entered by 11 ContestChest.com members. 7% of those who opened the contest, entered it.